The long Labor Day weekend is for us an excuse to get out of town, and this year we headed out to Utah in our Sportsmobile. It's still a little early for the desert, but rain was forecast for the mountains, and given the choice we opted for hot over cold and wet. Spoiler alert: excellent choice. 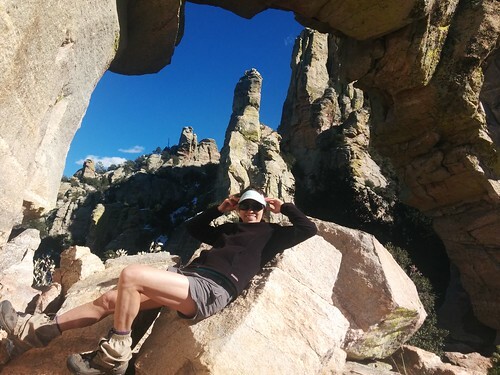 Because I'm still a bit injured, backpacking or mountain biking was off the table, so we went to Comb Ridge, where there are many relatively short dayhikes to ancestral Puebloan cliff dwellings and rock art panels. 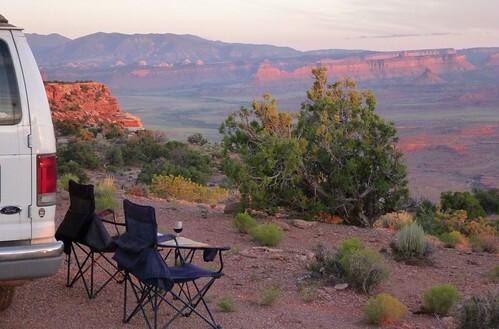 Comb Ridge is part of Bears Ears National Monument, and actually it's one of the few areas within it that is still protected as a national monument, which yay. 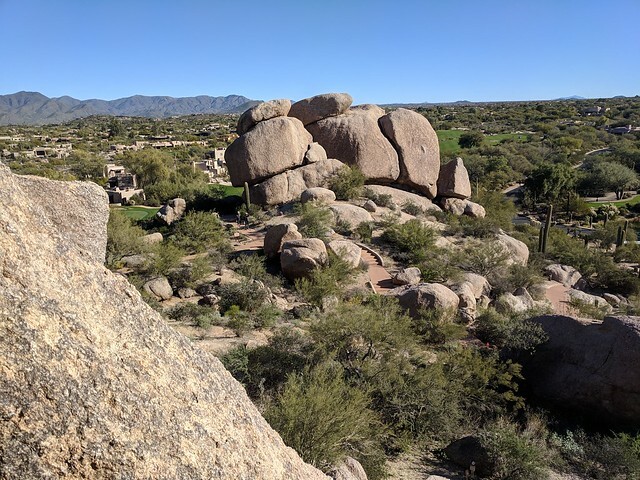 It's about two and a half hours to the accesses to the dirt roads which run up each side of the dramatic rock ridge, so we left on Saturday morning to give us time to do some hiking that day. 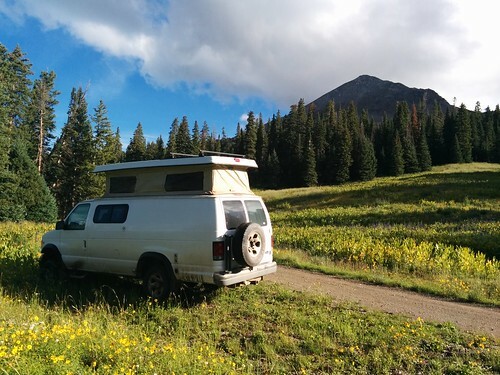 We decided to do a spontaneous micro-vacation last weekend and get out of our smoky town, driving our Sportsmobile east to Wolf Creek Pass to hike on the Continental Divide Trail. 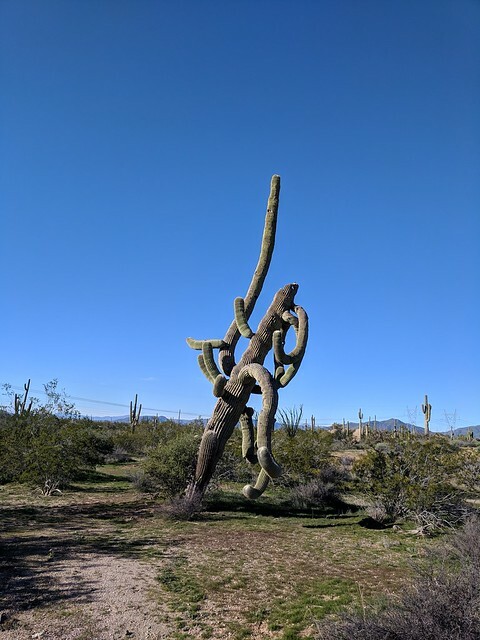 If you've got all summer, you can start at the Mexican border and hike all the way to Canada, but with only a weekend we just did out-and-backs, going south on Saturday and north on Sunday. 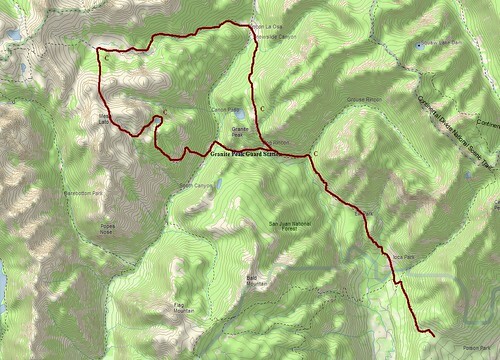 Our first day's hike was 13.6 miles long (roundtrip), our second day 11.8, and lots of elevation gain/loss both days. 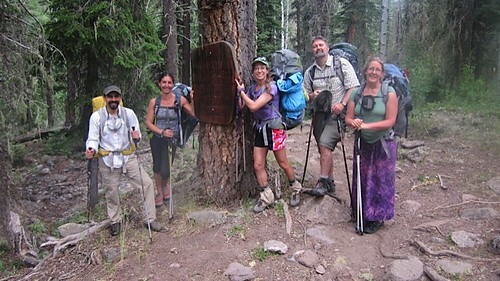 It was nice to get out, and we were tired and happy by the time we pulled back into Durango on Sunday night. I haven't been posting in a while, bad me, so you're forgiven if you've forgotten that I'm doing the Kendall Mountain Run tomorrow. I'm a little less prepared than I'd like to be, mostly because I fell really hard while trail running twice in successive weeks, then also fell hard mountain biking, and so I've been more cautious and doing less trail running than I really should have been. But I have been hiking and biking and running! So, tomorrow I am getting up way too early and going up to Silverton (it's about an hour's drive) with a friend who is also running. Now that I've seen what the course is like (we drove the first three miles to get to the trailhead of our late-June overnight backpack) I don't think I can make sub-3; I'm hoping to come in somewhere around 3:30. But my main goal is to NOT FALL. We did our annual backpack in the Weminuche Wilderness at the end of July, but gah, I have so many photos to go through and so much to write about that I haven't even started trying! 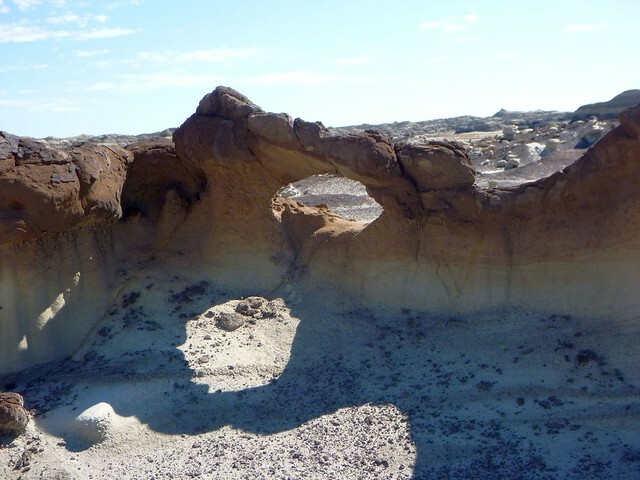 So instead have a very short write-up about a mini-trip we did last week to the Bisti/De-Na-Zin Wilderness in New Mexico. As you probably know, the Perseid meteor shower peaked last Wednesday night/Thursday morning, and as it was expected to be an "outburst" event with many more and brighter meteors than usual, we decided we ought to spend that night in the desert, where we could sleep outside far from city lights. For previous celestial events we've camped at Valley of the Gods near Mexican Hat, Utah, and originally we'd been planning to head out there, but at the last minute we decided to go south rather than west. 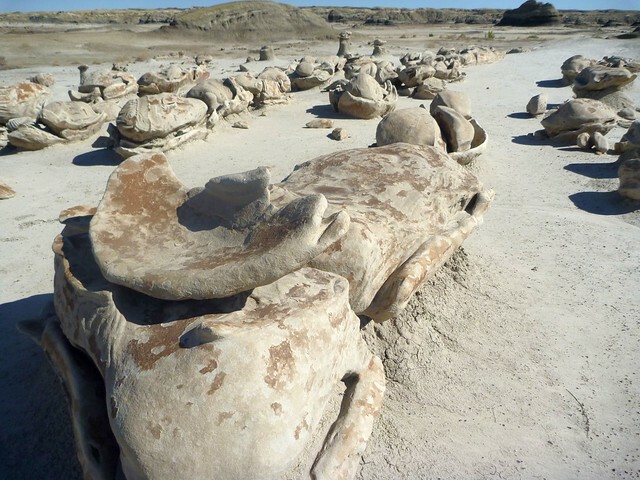 Neither of us had been to the Bisti Badlands, and it's about the same driving distance, around two hours. We headed out after work, following Google Maps. When we got there, we found a nice flat spot to park the Sportsmobile, with room to lay out a tarp and sleeping bags nearby, not far from the main parking area. 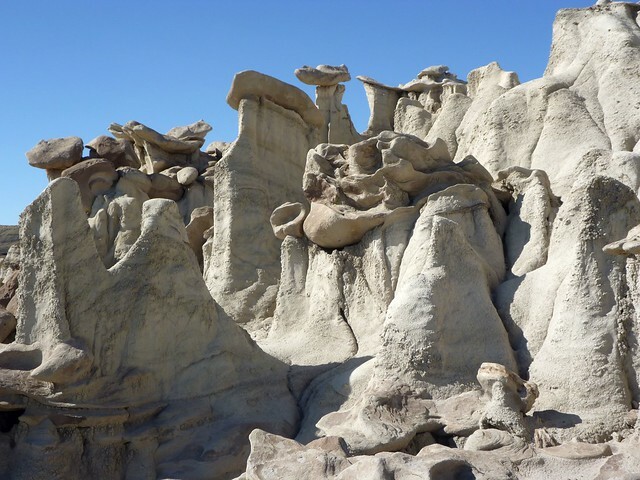 Two other vehicles were parked not far away, and as we surveyed our spot we noticed a group of people with packs heading into the hoodoos. Clearly others had the same idea! After a brief hike down a wash through some of the formations, we returned to the van for drinks and dinner. Then, as the sky darkened, we took out a pair of binoculars for each of us and looked at the various planets: Jupiter, Mercury, and Venus were all visible near the west horizon, while Mars and Saturn were in Scorpio near the moon - a five-planet night! (Mercury was particularly cool to see since it's rarely visible.) I saw an amazing meteor slash across the sky even before it got fully dark! We went to sleep around 10 and woke up around 1:30 am, after the moon had set, and watched the Perseid display for a couple of hours. There were only a few really bright ones, but the frequency of meteors was impressive - sometimes we'd see one after another, four or five within a minute. When we could no longer keep our eyes open, we went back to sleep. The sun woke us after we'd had far too little sleep, but we got up anyway, because we wanted to hike around the badlands before it got too hot. This is seriously a wilderness, in that there are no trails and no water sources: hikers are advised to bring a GPS (we had a GPS app) and plenty of water. A map at the parking area indicated several areas of interest, and Britt had grabbed the coordinates of a few others from people's web pages. 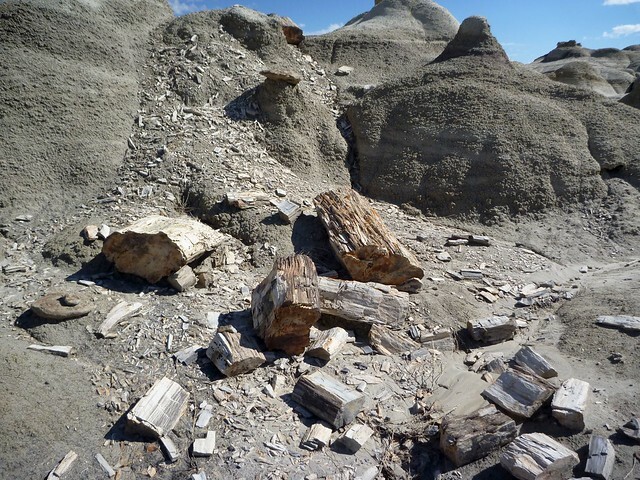 And other strange landscapes, weirdly-shaped rocks, and petrified wood that looked exactly like someone had just split a few logs and left them there with the woodchips scattered around them, and it had all bleached in the sun. Then we tried to lift them.... It was like a practical joke played by nature, "Haha, you think this is wood, but it's NOT!" The best of our photos are on Flickr. We definitely need to go back at a better time of year (spring or fall) and explore further! For the last several years we've done a summer backpacking trip in the Weminuche Wilderness with more or less the same core group of friends. 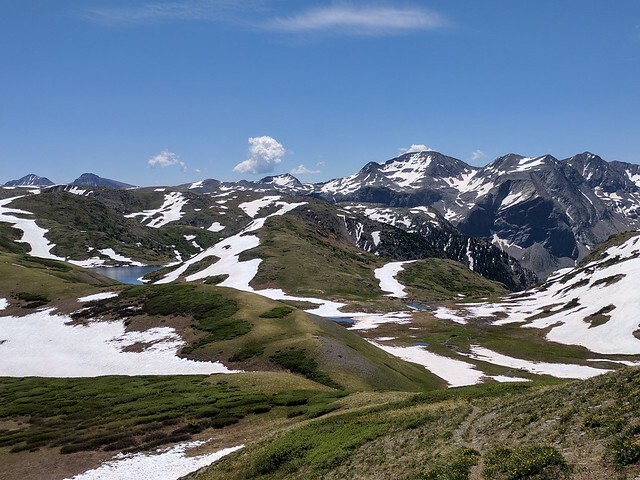 This year, because we'd had little snow, we'd planned on hiking a route in the high mountains east of Silverton, but then May happened, with near-record precipitation and more expected. 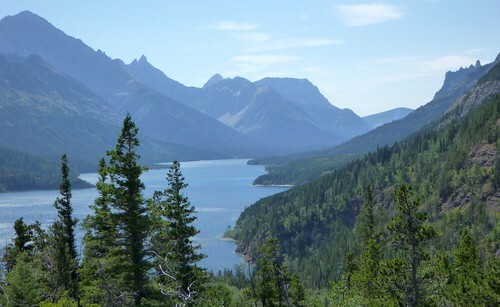 Instead we decided to do the prudent thing and choose a lower route: the length of the Pine River from north to south within the wilderness area. Britt and I have hiked (or ridden on horseback) every bit of this ~30 mile route at different times, but never as a continuous route, partly because the northern trailhead is quite far away by car, as one has to drive around the wilderness. Fortunately, Frank and June, who had wanted to come along but were not able to spend the whole week backpacking, offered to drive us all up and hike part of the first day with us, and Steve and Ryan, who usually join us at the weekend, would drive to the southern trailhead with our van, and then hike in and meet us. You won't find the Pine River on the map. That is, it's there, but it's Los Piños on the map, as well as on the little signs at every highway bridge crossing; but there is no surer way of branding yourself a tourist or a newcomer than calling it by that Spanish name. 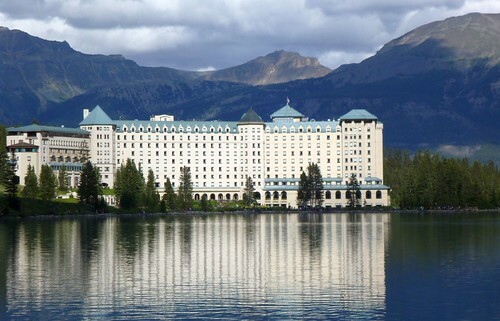 All the locals call it the Pine, and there are many businesses named for it as well, e.g. the Pine River Bank and the Pine River Library. 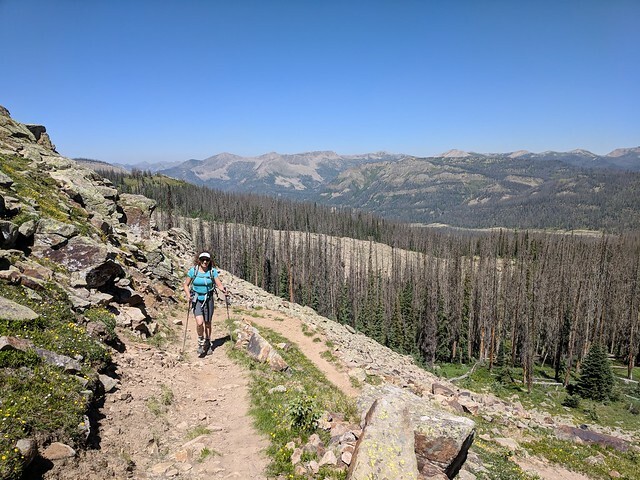 Our route started at the Thirtymile Forest Service campground just below the Rio Grande Reservoir and contoured along the bank of Weminuche Creek about five miles to Weminuche Pass and the headwaters of the Pine. 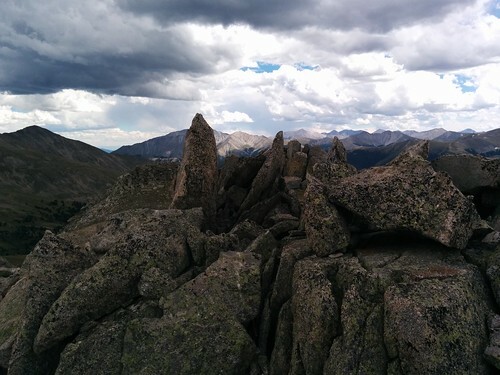 At just under 10,600 feet, Weminuche Pass is one of the lower points on the Continental Divide. Weminuche Creek falls steeply into the Rio Grande, and with all the recent rain, it was very high, nearly undermining the bridge over the waterfall a few miles in, where we ate our lunch. But on the Pine side, the valley is broad and flat, and shortly after we crossed the pass we set up camp at a small established site. I'm still getting over the cold I got while in Maryland (my third this spring, gah!) and my back is still giving me grief. But I'm trying not to let my stupid body prevent me from having fun. 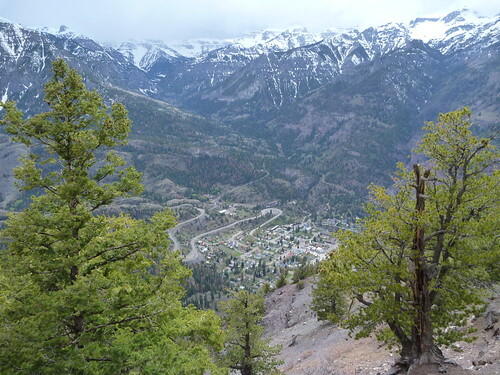 Ouray is famous for many things, including its natural hot springs. We checked into a nice small motel, the Wiesbaden, which features not just hot pools but also a vapor cave under the building, which used to be a sanitarium for treatment of arthritis. Despite the dicey weather we went for a hike; sure enough, we got rained on on the way back, but we warmed up in the hot spring water! The trail we climbed (and I do mean climbed - my map-corrected GPS track claims we ascended over 2500 vertical feet in 2.6 miles before turning around) goes to the upper Cascade Falls and the Chief Ouray Mine, but we had to turn around less than half a mile from the end because the trail hit a deep snowbank on a steep slope, and proceeding would not have been safe. But we did get some good exercise as well as interesting photos. 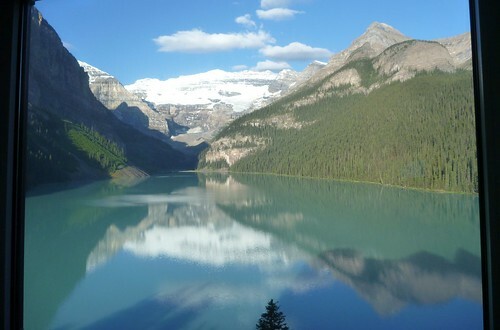 Anyway, good preparation for this summer's first backpack trip which will be in just five weeks! I need to write up my Imogene report (spoiler alert: it did not go very well) but I am behind! I still haven't written up anything about our Labor Day Weekend vacation (which was a little longer than planned - we got home Wednesday morning, and then I left for Ouray on Friday afternoon, thus the backlog)...and I don't think I will get the chance. But have some pictures of the trails around Crested Butte, and the Black Canyon of the Gunnison. Last week I was in Boulder to take a class on the climate model we use. I didn't think I'd be able to get a lot of running in while there, since I would have to catch a shuttle bus at 7:45 each morning, but it turns out that when I'm on my own I am pretty good at waking up early early, rolling out of bed and into my running clothes, and hitting the path. I ran between 5-8 miles each morning, got in another 4-miler on Wednesday evening (I ran to West Flanders Brewery on the Pearl Street Mall for beers and dinner, then took a bus back to my hotel), and did 11.5 miles on Saturday morning since I didn't have to go to a class that day. I wasn't much of a runner when I lived in Boulder, but it was nice to run on the creek path where I used to ride my bike. Britt drove up in the Sportsmobile on Thursday, carrying our bikes on the back rack, and on Friday after my class we biked up the path to our old house at the mouth of Boulder Canyon, where we lived from 1987 (well, Britt did; I moved there in 1990) until 1999. It broke our hearts a bit to see that it's now a rental, and the guy who lives there now didn't want us to go inside or even walk around the yard, but he moved in three weeks before the Great Flood of 2013, and he told us all about the damage the house and yard sustained when the irrigation ditch at the top of the hill behind the house failed. In the morning we returned to the main road and drove to just short of Cottonwood Pass, where there is a trailhead for Brown's Pass and Mt. Yale. 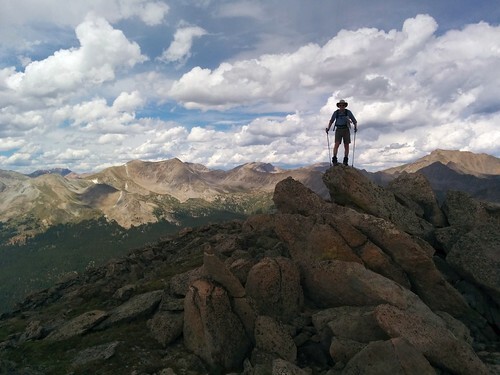 As Yale is one of Colorado's Fourteeners (mountains 14,000 ft high or taller) and it was Sunday morning, the trailhead was, predictably, very crowded. But we turned off at the junction for the pass, and saw only a few people. It was a lovely hike. After having lunch at the pass, we followed a trail to the ridge above, and when the trail crossed to contour around the side, we left it to strike out straight up toward the nearest high point. This turned out to be the cleverly-named Point 12,955 (wanna guess how high it is?) 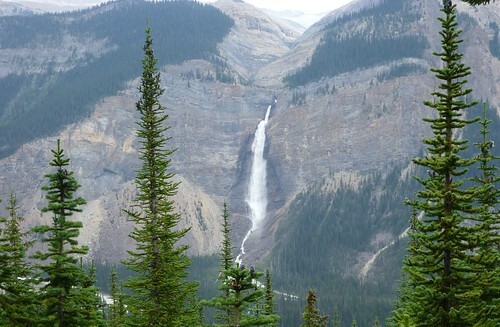 which gave us excellent views of Mt. Yale and the surrounding peaks. We also saw a whole family of ptarmigan (including adorable chicks!) but unfortunately their gray-and-white color scheme blends into gray-and-white rocks so well that I couldn't actually find any birds to point out in any of my or Britt's photos! A lot of thunderbooming accompanied us on the way back down, but we didn't get rained on, and we stopped here and there to pick some mushrooms we'd seen on the way up (boletes and hawkswings). Then we drove over Cottonwood Pass and down past Taylor reservoir, camping for the night off a dirt road close to the intersection with the road that continues on to Crested Butte. The next day we continued south through Gunnison, then veered off onto the road to Cochetopa Pass, which rejoined our usual route between the Front Range and Durango in the San Luis Valley. And now we are home again, home again....but Labor Day Weekend's coming up soon - which means, time for another road trip! 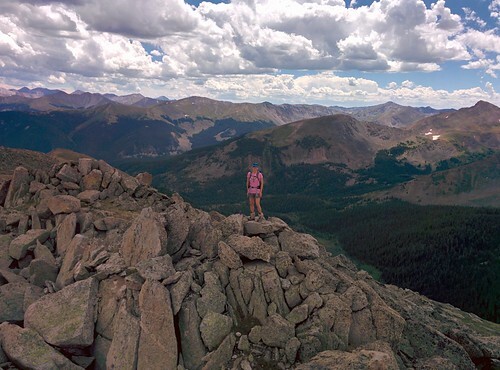 Some people choose the peaks they want to climb by their position on a list: the Colorado 14ers, say, or the highest 100 in Colorado, or the highest point of every state. We choose our destinations because they look cool. In the past years, we've climbed a lot of mountains just because we've seen them from the other places we've been. 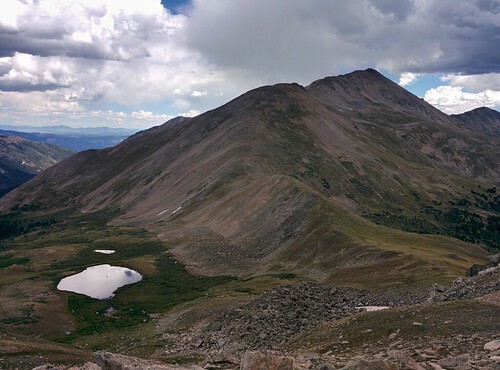 So it is with Lone Cone, which at 12,618 feet is not a very high mountain at all by Colorado standards. 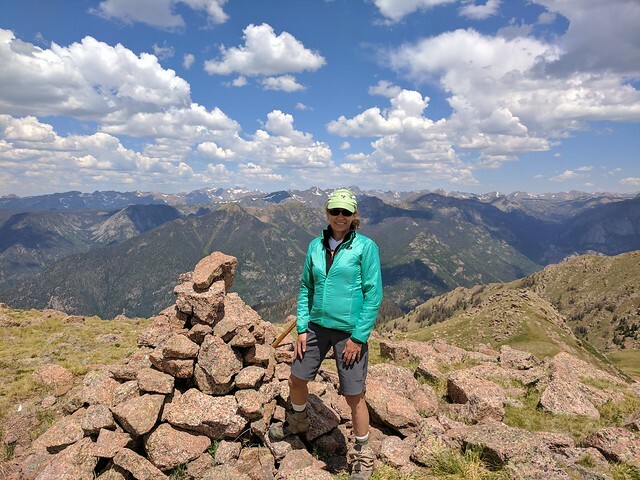 But standing alone at the western edge of the San Juan Mountains, it's a distinct landmark, and after seeing it in the distance countless times on drives to and from Utah, we figured it was time to get out and climb it. As we did last year, we got together with friends for a backpacking trip in the Weminuche Wilderness over the 4th of July holiday weekend. 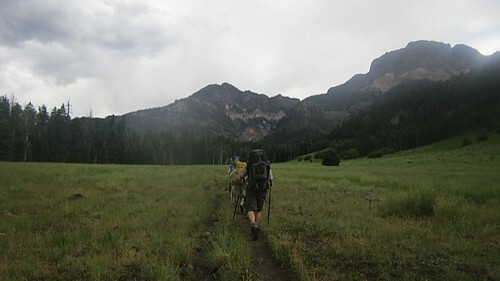 This year we headed for the Poison Park trailhead northwest of Pagosa Springs, which is a good access point for the upper Pine River and Rincon La Osa, where we'd spent the same holiday weekend in 2008. But this time, instead of sticking to the main trail, we bushwhacked along game trails up the west side of the Pine River valley until we picked up an old and overgrown trail leading to Elk Lake; from there, continued up and over Mesa Lato and then down into Rincon La Osa from the south, where we laid over a day before heading back down the valley to the Pine, then up to the bench above Granite Lake, to rejoin our inward path.